This Grade II listed Georgian mansion is set in its own landscaped grounds and enjoys panoramic views of the Eden Valley, the Pennines and Lakeland Fells. Overlooking the busy market town of Penrith, the Roundthorn Country House is located in an extremely peaceful and secluded environment, only minutes from the M6 and A66. 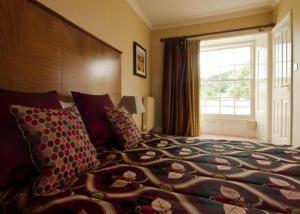 All of the en suite rooms are unique in character and furnished to the highest standard. The house has its own bar/lounge and a cosy residents' lounge with a real fire in the winter where you can relax and unwind. Served in the Eden Room each morning, the Great Cumbrian Breakfast is guaranteed to prepare you for the day ahead. The bar/lounge area and several bedrooms and en suite bathrooms have been upgraded and refurbished in early 2008. The hotel has since been awarded a 5-Star Silver rating in the guest accommodation category by VisitBritain.